One Seattleite doesn't read papers: "I get to work and pull up my Google news"
SEATTLE, Washington (CNN) -- Reporters, editors and photographers at the Seattle Post-Intelligencer prepared their final contributions to the paper, toasted one another with shots of Wild Turkey and packed up their desks in an "eerily clean" newsroom as the final edition of the paper went to the presses Monday night. 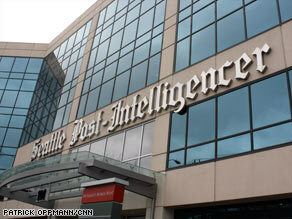 SeattlePI.com will continue to cover breaking news, Managing Editor Dave McCumber says. The paper -- which was the oldest continually operating business in Seattle -- published its final print edition Tuesday as the P-I makes a transformation into an online-only news outlet. A skeleton crew of 20 to 25 staffers will remain at the new Seattle PI.com while more than 140 staffers will lose their jobs. "Its been an opportunity to experience your community first-hand," staff photographer Meryl Schenker said of her 13 years with the paper. "You meet people from all walks of life, and that's been a real privilege." P-I journalists coming into the newsroom Monday morning were told by management that they would "put the paper to bed for the last time" that day. Other reporters and photographers on assignment when the news broke received texts about it from their colleagues. The P-I is the largest paper to go under in an economic climate where newspapers are facing a steep drop in advertising revenues and readership. At the same time, newspapers are also forced to compete with Web sites that republish news stories but do not share the costs of producing them. Last month, the Rocky Mountain News in Denver, Colorado, published its final edition after nearly 150 years. Last October, the Christian Science Monitor also announced that in 2009, it would replace its daily print edition with its Web site. It also offers subscribers weekly print and daily e-mail editions. "It was a combination of time and really rotten economic conditions that caught up with us," Ogelsby said. The announcement came a little more than two months after Hearst Corp. which owns the paper, announced that it would either sell the P-I or close it. For months, the paper's staff prayed a buyer would come through while covering the city and the drama surrounding their own future. "There's some relief in knowing," Managing Editor David McCumber said. "And some excitement about SeattlePI.com. We'll be the first paper to go online only. So I am glad the globe will keep spinning on the roof and there will still be a P-I in Seattle even if it will be online only." The Web site will solicit contributions from the community, link to other sites and continue to cover breaking news, McCumber said. iReport.com: Are you a newspaper person? "We want to engage as many people in the community as possible with the Web site. It's going to be different, there's no question," he said. "I wrote about the port of Seattle. Looked at some of the ways the port was mismanaging public dollars," said investigative reporter Ruth Teichroeb, who lost her job after 11 years with the paper. "I've looked at vulnerable adults who were being mistreated in group homes across the state. I have written about children at a state school for the deaf who were mistreated for decades. Those are the kinds of stories that the city is losing now." The P-I's rival, the Seattle Times, will still publish a daily newspaper, but that paper also has been plagued with financial difficulties, prompting some Seattleites to worry that they may soon live in a no-newspaper town. Under a joint operating agreement, the Times and P-I shared production costs while remaining editorially independent. "You lose two things. You specifically lose all the stories the P-I might be doing, but you also lose a competitive news environment. It makes us a lot sharper, and it certainly has made them a lot sharper." David Lonay, a subscriber since 1950, told CNN affiliate KIRO he'll miss the morning ritual of picking up the paper. "The first thing I do every day is get the P-I and read it," Lonay said, according to KIRO. "I really feel like an old friend is dying." Sitting in a downtown cafe near the P-I, Jesse Stewart said he doesn't read either local paper because of the environmental issues involved with producing newspapers and the convenience factor of reading news online. "I get to work and pull up my Google news. I guess I am part of the problem."